Let's jump to the realm of virtual reality. There are lots of companies putting out virtual reality headsets this year and next. Google's response has been the almost-sarcastic but surprisingly effective Google Cardboard – literally a cardboard container that you slot your phone into and put on your head. The new product is the Google Daydream – which is a very fancy $79 version of Google Cardboard. Unlike some other very heavy and often hard VR headsets, the Daydream is light and comfortable. It's made from the kind of material used in clothing, stretchy and soft rather than hard plastics. It works in much the same way as the Cardboard – you slide in your new Pixel camera and a latch on the top holds it in place. Then you have a remote control – which stashes inside the headset when not in use. It works like a game controller. We tested it out, and amazingly, it was on a par with the other systems we've tried out, including the Oculus and Samsung Gear. In fact, due to the comfort factor – it also works over glasses – in many ways it was nicer. The experience was completely immersive, the control works extremely well, it didn't feel clunky or slow. It was fun. That said, the focus did occasionally slip and the fact is that when you are so physically close to a phone screen, you can see the pixels. Just as a side point: are we all choosing to ignore the fact that ramming a screen inches from your eyes for hours at a time is unlikely to do your eyes or brain any good? So, it's equivalent to the other gear out there. The big question of course is: can Google build a big enough developer market to make games for it? It is notable that it demoed an educational VR video and an (admittedly cool) game tie-in for the new Harry Potter-style movie from Warner Brothers. Without sufficient content for gamers, even at the extremely decent price point of $79, Google is not going to find a huge market for this. But it could. 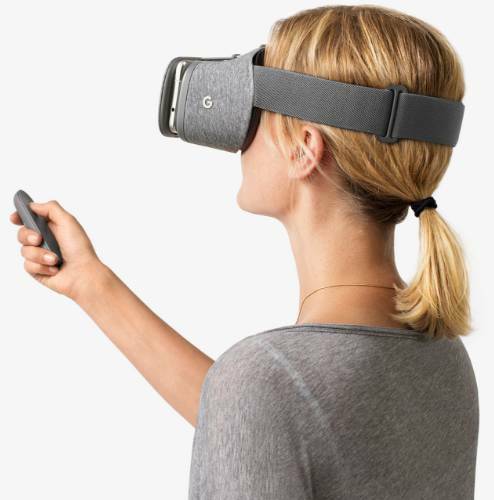 Likelihood of success for Google Daydream: Medium. Rather embarrassingly, Google has called its new Chromecast streaming box the same name as a new product from the competitor Roku – the Ultra. Google claims to have ironed out some of the bugs of Chromecast and will now stream hi-def music and 4K video through its little device. It also has an Ethernet port, showing that Google thinks it might be able to convert people into an all-Google eco-system. Google still has some way to go if it really wants to compete with the high-end video streaming market – the Roku Ultra and Apple TV. But at the low end, for music streaming and for people wanting to stream to their TV easily, the Chromecast looks pretty compelling. It costs $69 – mid-market in terms of cost. If you want to go all-Google, the fact the Chromecast works seamlessly with Google Home – or at least that's what Google claims – is a definite plus point. This is not going to make Apple very happy. In fact, we imagine that Cupertino is having a bit of a meltdown today. Likelihood of success for Google Chromecast: High.